Irritated with weird guesses of economists, social activists, media panelists and anti-corruption reformers, India's Agriculture Minister Sharad Pawar finally announced that he is a richest person of not just in India but also world and he has assets worth more than 15 trillion dollars. "Hey guys stop estimating and making wild guesses. Value of my assets is 15.54 trillion dollars (i.e. 15540 billion dollars or 30,04,70,000 crore rupees), that means I have more than 30 double crore rupees. So it is better now you go and seat in your home and have some time to relax," said India's Agriculture Minister and powerful politician Sharad Pawar. Sharad Pawar also confirmed that his wealth is growing faster than American GDP and it would be double than US GDP in next 10 years. "Yea actually I am very progressive by nature. I invest in the countries which are expected to grow faster or exponential. Simply business of corruption is most lucrative among any businesses. Most of the countries have my money invested through this name that name or any kind of name. I also have 55 bunglows filled with huge amount of cash. Even I have kept 100s of warehouses for keeping coins in dollars, rupees, yuans, yens etc. Whenever RBI requires change, it asks me. Even those different stamps you saw on coins those are decided by me. I also print huge amount of currency through my printing presses. What do you think those all printing presses for currencies are owned by RBI? Forget it, all of them are owned by me," Sharad Pawar educated India Satire correspondent. He said "I also believe in fast money creation with more and more money changing the hands. So I try to create money by motivating others to change their hands. For example, if Shrivastav wants some government approval he just go to Peon Kamble who asks some 100 rupees and then spend on Vijay Mallya's beer who makes profit from it and then invest in different businesses, generates jobs etc (forget that he is not paying anything to his staff). So this is a faster way to develop economy." 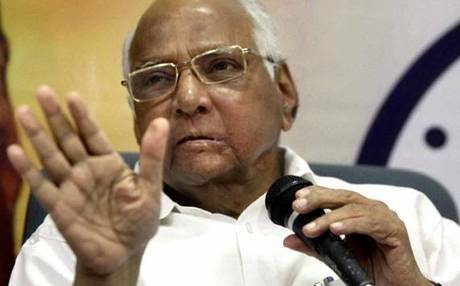 Talking about his property, Sharad Pawar said "Actually, since 1970 when I last valued my property it was worth around 5-6 trillion dollars, however, since then I have not calculated. It must be more than America's GDP for sure. Conservatively, I think it should be at least triple the money I had earlier." However, Sharad Pawar appealed the entire India's population to stop wasting their precious time on counting his wealth and focus on their day to day work so that few more government servants and politicians become multi-billionaire.